Chocolate remains to be one of those nearly universal indulgences that most people can enjoy (barring allergies and things of that nature). When you like them dark and bitter and light and sweet, everyone has their unique appreciation for this tasty dessert treat. And thus it is no wonder that many authors, playrights and screenplay writers have used it as a focus for their creative drives. 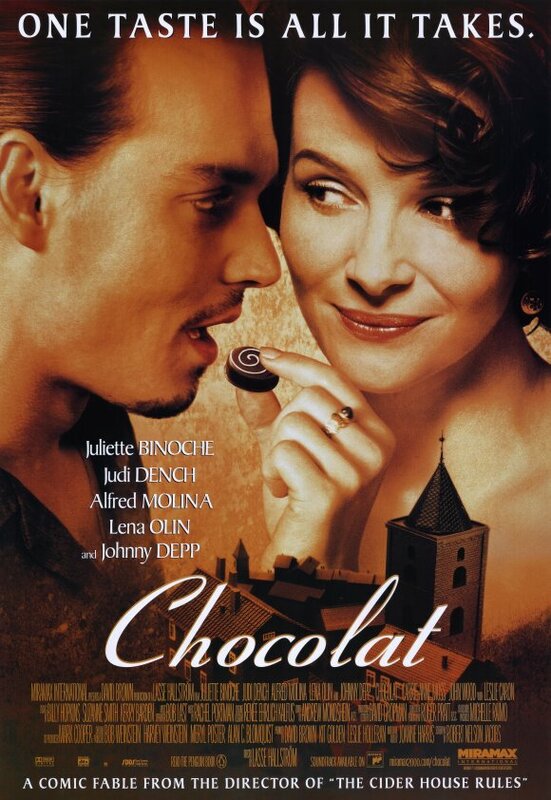 Oddly enough, this is one of two chocolate-centric movies that I know that both happen to be inspired by books. I used to get Chocolat confused for Like Water for Chocolate all the time because of the their use of chocolate as a theme for their stories. But when you really take time to think about the two, they're very different indeed. I first caught this movie on HBO some time back and never regretted the experience since then. And recently we introduced the movie to a chef friend of ours, thus inspiring this particular review. Synopsis: Chocolat is a 2000 romantic drama movie based on the novel written by Joanne Harris. The movie was directed by Lasse Hallstrom with a screenplay by Robert Nelson Jacobs. The movie had been nominated for numerous awards including the Academy Awards for Best Actress (for Juliette Binoche), Best Picture, Best Original Music, Best Screenplay - Adapted and Best Supporting Actress (for Judi Dench). 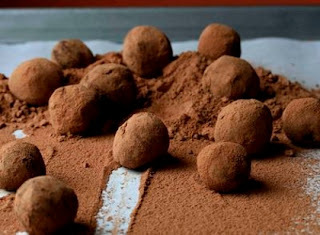 The movie centers around wandering chocolatier Vianne Rocher (Juliette Binoche) and her daughter Anouk (Victoire Thivisol) who settle down in a small French village. The mayor, Reynaud (Alfred Molina), leads his citizens to wholeheartedly embrace their rich (yet often conservative) traditions of restraint and piety. Thus it is to his chagrin that Vianne opens her new chocolate shop just as the Lenten season (thus a period of self-sacrifice) begins. In addition, she dresses in more alluring (and rather red) dresses whereas everyone else keeps things covered and conservative. But slowly but surely Vianne starts to make new friends among the villages. 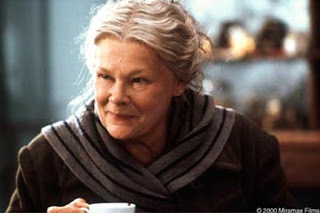 One is the elderly Armande (Jude Dench), who starts out rather bitter and surly until Vianne uses chocolate to get past her gruff exterior. Armande's frustration is the fact that her daughter, Caroline (Carrie-Anne Moss) doesn't want her to see her grandson Luc (Aurélien Parent-Koenig) since she's a bad influence. Vianne also makes friends with Josephine (Lena Olin), who is married to a rather abusive drunkard of an husband, Serge (Peter Stormare). There's a semi-mystical, magical element to things especially given the almost Mary Poppins like nature of Vianne and how she goes pretty much where the winds take her. It appears to be the way of her family, but the exact reasons for this aren't quite explained in plain speak. Add in Vianne's little plate that she spins to help her determine what chocolate creation to serve to the customer certainly adds a nice sense of whimsy to things. The movie features a lot of interesting combinations for chocolate drinks and desserts. And the way everyone seems to enjoy things, one can't help but wonder what adding a little chili powder to your hot chocolate might do for your mood. Or perhaps trying to create a chocolate sauce to go with your lamb chops or whatever it was that she served just then. In this regard the movie does a great job of celebrating good food. The movie has some pretty strong religious themes naturally part of things. And it's not about saying Christian traditions are bad or that even sweet indulgences are bad. It's more about avoiding excesses and finding a balance to things. Which is a cool way to manage things indeed since it can still involve chocolate. The movie is filled with a variety of interesting characters, which is somewhat typical of stories like this. And I'm referring to books since it's only in such works of fiction that you get such rather extreme and yet still rich characters all in one place. And it does make for a very fun movie. Well, that and Johnny Depp happens to be involved as well. You may squeal now, ladies. Chocolat is a lovely movie that acts like a modern parable of sorts. And good parables or modern fairy tales of a sort mean a little magic, a little romance and a good ending. Thus the movie gets 4.5 interesting chocolate treats out of a possible 5.